« LD18: Stop That Hero! Ported to Win32! Last year I posted about my shopping trip to a hobby store to buy game design prototyping tools. Some weeks ago, I bought even more items, such as tiny wooden barrels and glass beads. These tools are great for doing quick and easy paper prototypes of game designs. I’ve been keeping them in small plastic bags, and all of those bags were in a larger freezer bag. While this was functional, it felt a bit lame. I’m a game designer, and some of my most important tools are in plastic food bags? It’s not right. So I went shopping again and found a nice toolbox for less than $15. It has these cool compartments that I can move about relatively easily, and when the lid is closed, everything stays in place. 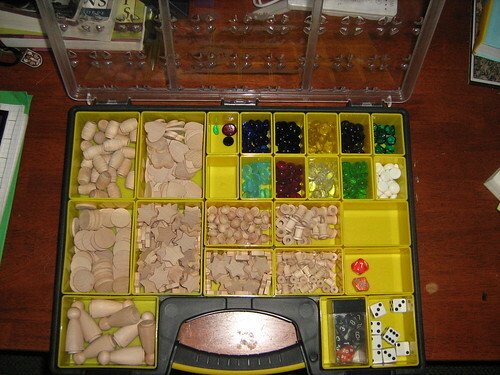 I put all of my wooden pieces and glass beads in the toolbox, and each gets its own compartment. I realized I had a lot more star-shaped wooden pieces than any other piece, though. I even had room for more things, so I put in some dice. My dice collection isn’t much, but I had them separate from my prototyping tools before. Now they’re all together. Here’s a shot of the toolbox opened. And here’s a shot of the closed toolbox. The plastic bags were a bit more portable. I could put the entire collection in my bookbag when I left home, but this toolbox is its own luggage. By and large, I don’t find myself going out to do prototyping, so it isn’t that big of a deal. 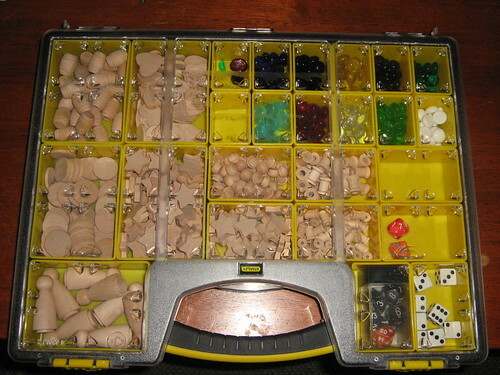 What’s in your game design prototype toolbox? How do you store your physical paper prototyping tools? I have a whole bunch of euro-style board games (like Settlers, etc). I usually just pull bits out of those games to find what I want. Another thing that’s really useful, but I don’t use as much anymore as I should, is some Hex and Square grids of different sizes that I xeroxed onto overhead transparencies. I can lay these on top of any picture (such as an aerial photo or topo map, or even an interesting illustration) and have an instant “level”. Also, play-dough. Or FIMO if you want to be grown up about it. I never do paper prototypes, digital has always seemed faster. It might be something I try if I work on a turn based game, or a mechanic that can be prototyped as turn based.